Choosing tulips from a catalogue is rather like deciding which confections to buy from a sweet shop. Each variety has something to tempt – colour, shape, perfume, size – and all are guaranteed to tickle your tastebuds and leave you wanting more. Having become wise to the bulb merchants’ penchant for enhancing their photographs and gilding their descriptions, I tend to consult a number of sources before deciding which tulips to invest in each year. At first glance I felt sure that the luminous beauty of Tulipa ‘Orange Dynasty’ could only have been achieved by skilful photoshopping. It turns out I was mistaken. The flowers glow, even in poor light, as if they were illuminated from inside. 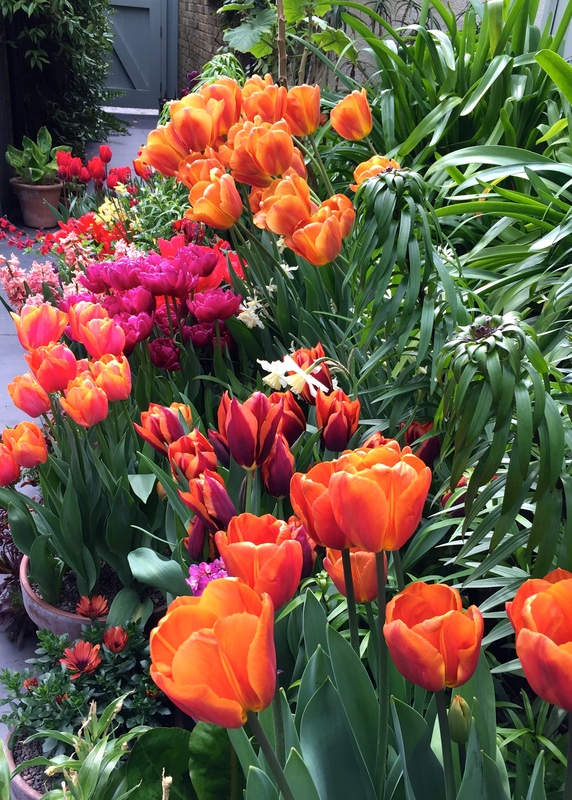 Like ‘Slawa’, ‘Orange Dynasty’ is a Triumph tulip. This means it’s the result of hybridisation between a single early tulip and a later flowering variety. 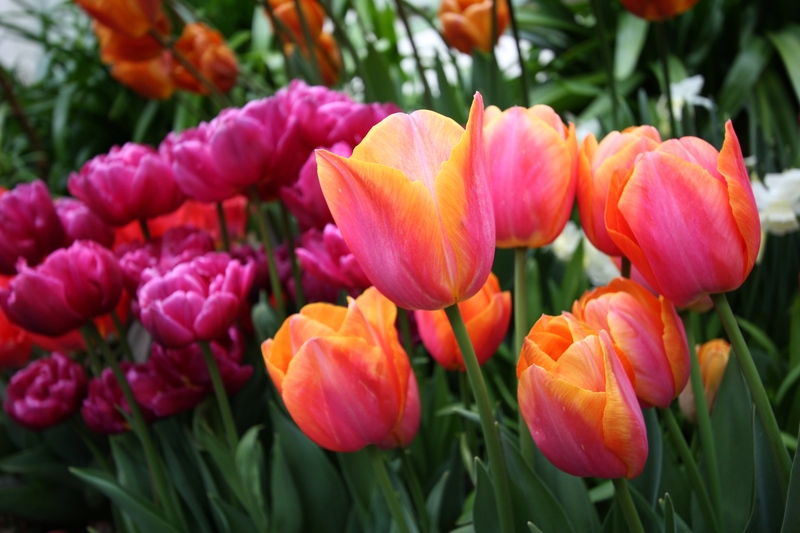 Triumph tulips are the largest and most important class of garden tulips, typically producing sturdy stems and classic, tulip-shaped flowers. They stand up well to wind and rain, have a long vase life and can be forced into flower indoors, if you wish. A versatile tulip, I am surprised to find that ‘Orange Dynasty’ is currently offered only by J. Parkers in the UK. A saffron-yellow ground suffused with hot pink makes this a good companion for plain yellow, gold and soft orange tulips, and for louder fuchsia pinks. 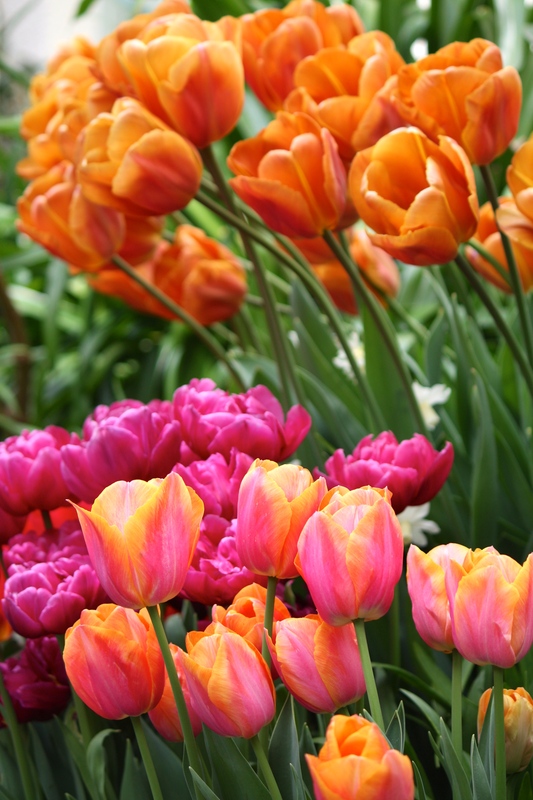 ‘Orange Dynasty’ could be stunning as the supporting act for single late tulips such as ‘Avignon’ or ‘Menton’ which are taller and would disguise any fading flowers. At the Watch House I’ve combined ‘Orange Dynasty’ with a host of other coppers, reds and magentas, but the flowers are outstanding enough to be displayed on their own or grown in the cut flower garden. One hopes a tulip of this calibre might catch on and be offered more widely. There are others in the family, including the original ‘Dynasty’, which has soft pink petals with white at the base, ‘Golden Dynasty’, ‘White Dynasty’ and ‘Salmon Dynasty’ all of which are pretty self-explanatory. 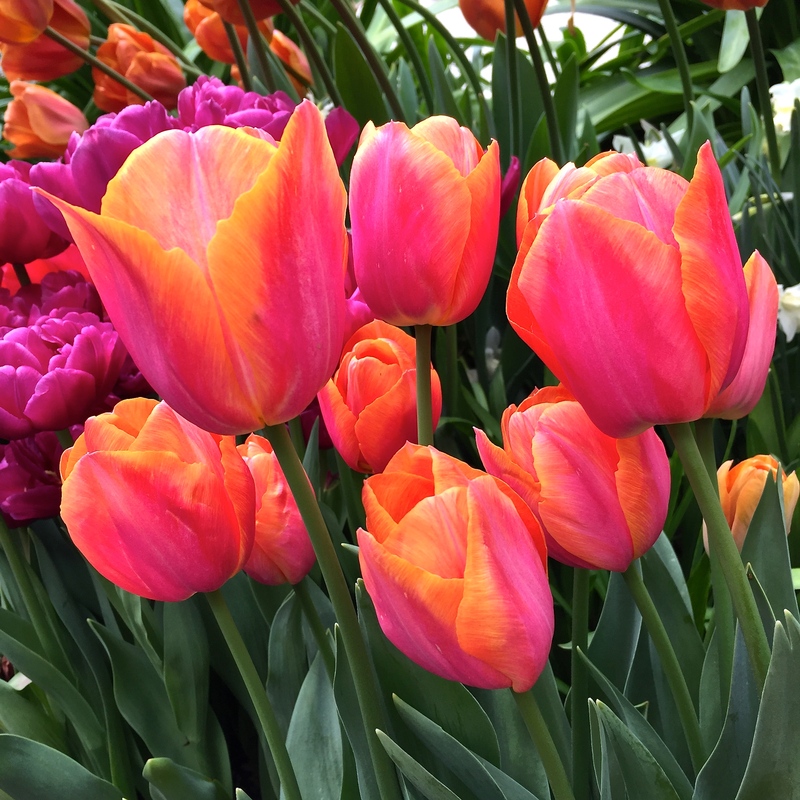 This widely grown tulip clan clearly possesses great pedigree, and ‘Orange Dynasty’ is guaranteed to bring flair and fire to any container, border or vase. TFG. Om nom nom. Very tasty. Want. As usual, stunning both flowers and photographs. I am envious, tulips do not grow well in hot Western Australia :(. Hmmm. They could probably take the heat, but they have to be cold in winter to get them going. Still, lots of gorgeous things you can grow that we can’t in the UK. We always want to grow the impossible don’t we? I can only take gardening with natives so far! Thanks. ‘Orange Dynasty’ is a very photogenic tulip! There is only one word for it…gorgeous! Yes, plays well with others…and you’ve invited the right friends. Sigh… Yet another tulip to add to my list! Lovely. What a great display and yes I will be adding a note to my most wanted list. I can’t help but notice the wonderful show you’ve made with Brown Sugar too. It is such a tall one isn’t it ? …. Mine are measuring ~70cm. Really tall, and getting taller by the day. Mine were planted incredibly late so have been playing catch up. Don’t they smell amazing too? I am afraid all the tulips go in the bin Sally. It sounds wasteful, but I don’t have borders to plant them in, or pots to spare. And they don’t come back and flower as well in future years. So, I prefer to start afresh each autumn. What a gorgeous colour blend! That’s a jolly good idea!